I can't say that I am much of a gamer. Sure, I played a lot of Colecovision and Nintendo when I was a kid, same as most folks. I even kept up pretty well with Nintendo products up through the Game Cube, but after that I went through a period where I really didn't play much. I did pick up an Xbox360 when I lived in Boston for a while, so that I could play online with some of my friends and try to keep in touch, but once I moved back to NJ I didn't really keep up with it. There were a few games that really connected with me during those Xbox years. The first Gears of War, both Portal games and Katamari Damacy. The first Katamari game never came out for Xbox, I don't think, but my wife had a playstation and we picked up that game based on a recommendation from my friend Alan. What a wacky game. You push around a little ball and as smaller items get stuck to it, it becomes bigger in a snowball effect. Then you can pick up bigger things as the size of your ball increases. Sounds silly, but it was pretty addictive. The best thing about the game was its incredible soundtrack. This is the first release on vinyl of this soundtrack, full of insanely catchy J pop/rock hits. Some songs are in English, some are in Japanese, but all of them are outstanding. After listening to the opening theme, it's pretty impossible to not have "na na na na na na na na" stuck in your head for about a month. It also makes the phrase"I want to wad you up into my life" sound way more romantic than it probably should. I will say that as a general rule, I'm not a fan of the vinyl movie and game soundtrack boom that's happened over the past few years. It seems like every weirdo horror movie and every obscure game is getting a vinyl pressing when I still can't even get Onehundredpercentfreak by Alligator Gun on vinyl. Sure, I partake occasionally. After all, I was very excited to be able to pick up the soundtrack to the original Godzilla a few years back. But for the most part, I think it's overdone and I can't fathom listening to those kinds of things very often. Obviously I've made an exception for Katamari, the songs are just too good. And Mondo has done an incredible job with this pressing. 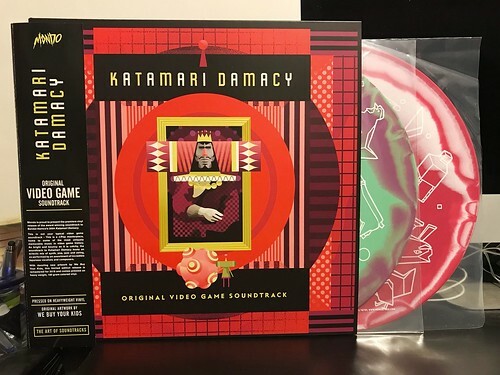 The artwork looks amazing, the vinyl colors are sharp and it's just a really nice package. I'm glad I grabbed this and I'm tempted to pick up the Portal soundtrack that they released, but past that, I just don't see what other video game soundtracks would be worth owning. OK, maybe I'd buy a 7" with the RC Pro Am song on it.